Steven Taylor celebrates his Posh goal at Cambridge. Photo: Joe Dent/theposh.com. 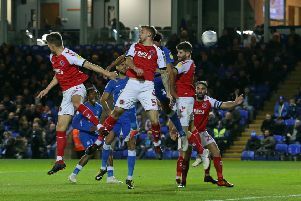 Peterborough United delivered a performance full of commitment to win 2-0 at local rivals Cambridge United in the Checkatrade Trophy tonight (November 7). Steven Taylor and Jack Marriott scored the goals to ensure Posh finished top of a group which also included Northampton Town. Marcus Maddison in action for Posh at Cambridge. Photo: Joe Dent/theposh.com. Taylor was outstanding throughout, but others in a strong side also improved on their weekend performance. Andrew Hughes: (for Da Silva Lopes, 70 mins). Idris Kanu: (for Edwards, 81 mins). Jermaine Anderson: (for Maddison, 81 mins).